Fully guided by best local expert in ice marathon running and professional English speaking guide. Pound your way on the run across the frozen surface of the worlds’ deepest and oldest Lake Baikal! 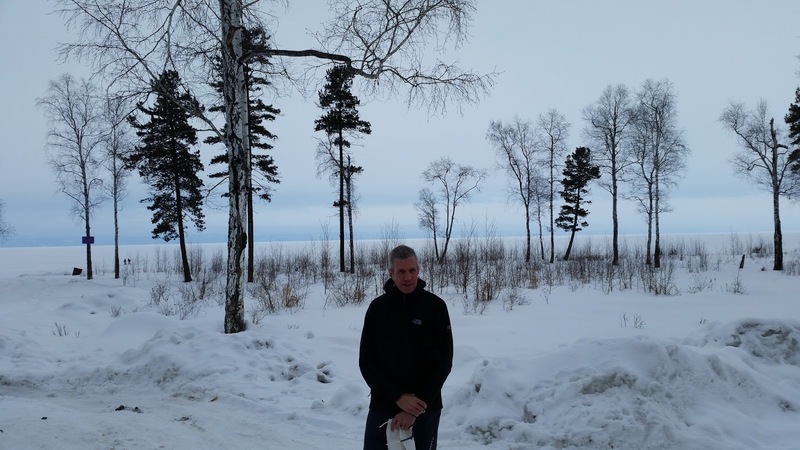 Mr. Arkadiy Kalikman – the 1-st athlete who ran across Lake Baikal 40 years ago– from one shore to another a distance of 42 km. Participant of all BIM editions, 3 times winner of the BIM, ran over a 100 marathons and ultra-marathons all over the world. Merited Traveler of Russian Federation and white-water rafts man, Active Outdoors, Sports & Eco-Tourism author, Executive Director of the Lake Baikal Guides’ Association, holding doctoral degree in physics and math Mr. Kalikhman published a number of scientific works on Lake Baikal, led several research expeditions in Siberia, Canada and USA. 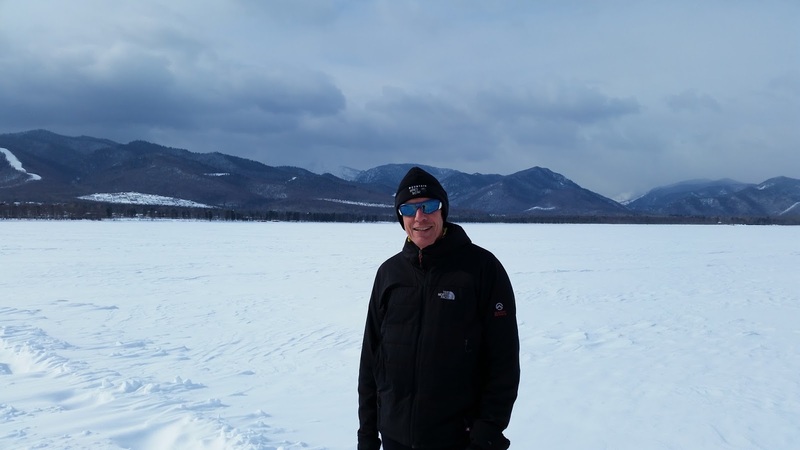 In 1994 took part in ultra-kayak marathon on Lake Michigan from Chicago to New York, and more….Specially for the BIM Training to Run Arcadiy Kalikhman developed well balanced and unqiue lectures and exercises that proved to be efficient tool for running across Lake Baikal in the BIM! Below see the photo of 5-countires team ( Russia, UK, Mexico, Australia, Japan) that achieved very good success after undergoing the BIM course led by Arcadiy Kalikhman, last March. 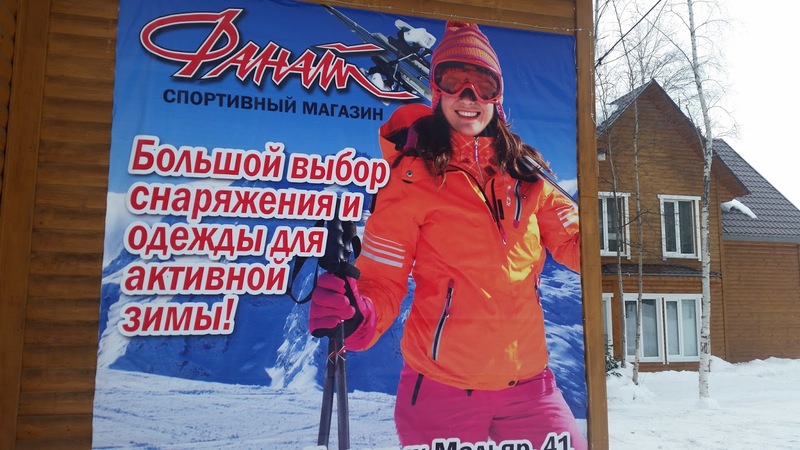 Among them was a young girl from Russian city of Kazan – Diana Ramazanova - who instead of 15 km made the 21 km!! – and was one of the first female half marathoners ( though she never ran before more than 5 km distance)!!
" ...Signing up for four days of pre-race training turned out to be a stroke of genius. It not only afforded me the opportunity of scouting the lake in advance of the race, it brought me under the wing of Arkadiy Kalikman, our trainer, veteran of every running of the Baikal Ice Marathon and three-time winner. He gave us loads of advice about taking on this challenge and urged us to be philosophic in accepting whatever came our way. “Man proposes. 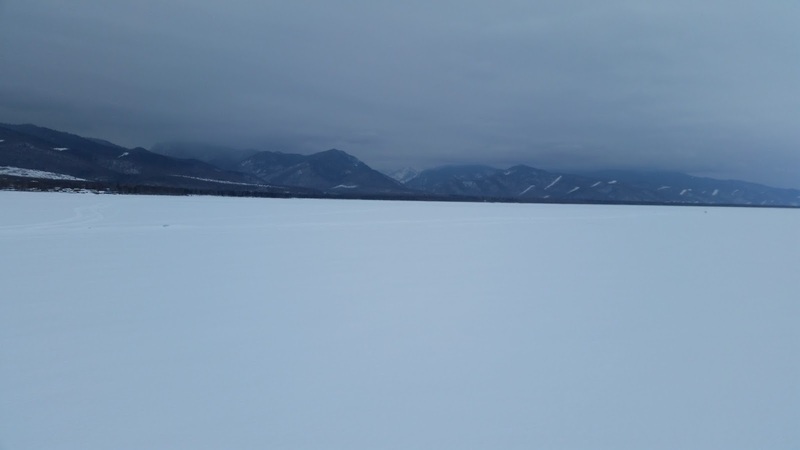 Baikal disposes.” I expected to experience the great lake, I had not thought I’d encounter a man who embodied its spirit in every fiber of his muscles and bones. What a joy! Now 68 years old, Arkadiy zipped past me at the 15 km marker and finished an hour ahead of me..I also owe deep gratitude to the other runners who took part in the BIM training program.. We instantly became BFFs, did everything together and became mutual agents of encouragement and support.. "
Welcome to Irkutsk – Siberia’s Microcosm and the gateway to Lake Baikal! Upon arrival in Irkutsk – we shall be there at the airport to meet you for a further transfer to the Courtyard by Marriott Irkutsk City Center Hotel – the -1st International hotel of world-famous chain in Siberia, located in the very heart of Irkutsk, very close to major historical sites. When checking in at deluxe rooms of the Irkutsk Courtyard by Marriott located in the historical and present downtown part of the city, enjoy welcome-drink, and after some time at leisure meet your professional bilingual guide at the lobby for a sightseeing tour of the city of Irkutsk often referred to as the Paris of Siberia, in the past. During the city tour you shall visit most atmospheric sites of Irkutsk including Znamenskaya Orthodox Cathedral famous for a rich collection of icons; graves of the Decembrists’ revolutionaries who were exiled by the tsar to Siberia for the ill-fated attempt to overthrow the tsar in December, 1825; and grave of so-called Russian Columbus –Gregory Shelekhov – an early Russian explorer of Alaska. We will also then have opportunities to take pictures of richly carved old-style wooden houses, see the Monument to Russian Pioneers of Siberia topped by the bronze figure of Alexander-the 3rd, the White House of Siberian Province as well as visit the local bazaar. Before dinner - meeet your trainer and guide for a briefing about your upcoming stay at the foothils of Sable Mountain.During the biefing you will also receive BIM special & exclusive products -BIM winter sports reversible vests ( see photos below) , and a detailed program. 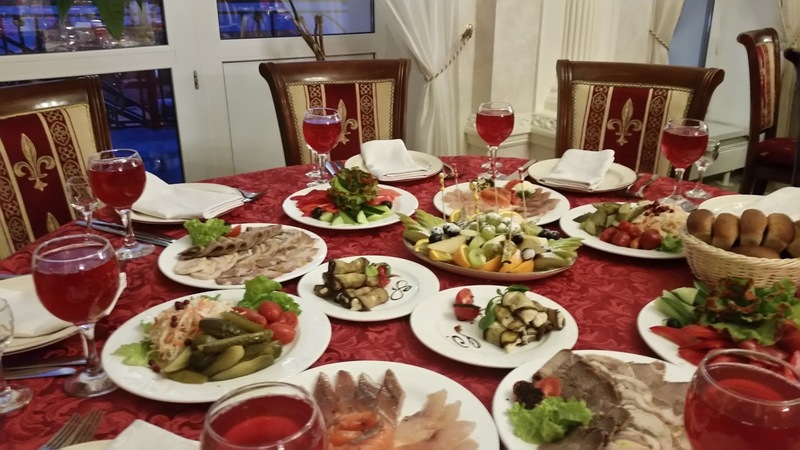 Dinner shall be served at Malty Homestead restaurant located in the 130-th historical quarter of Irkutsk. Overnight at the Marriott Hotel. After open-buffet breakafst served at the hotel , check out for a transfer to the BIM training lodge located near Baikalsk, 145 km away from Irkutsk). En route enjoy lunch of Buryat National cuisine at the Golden Yurt cafeteria in Sludyanka. 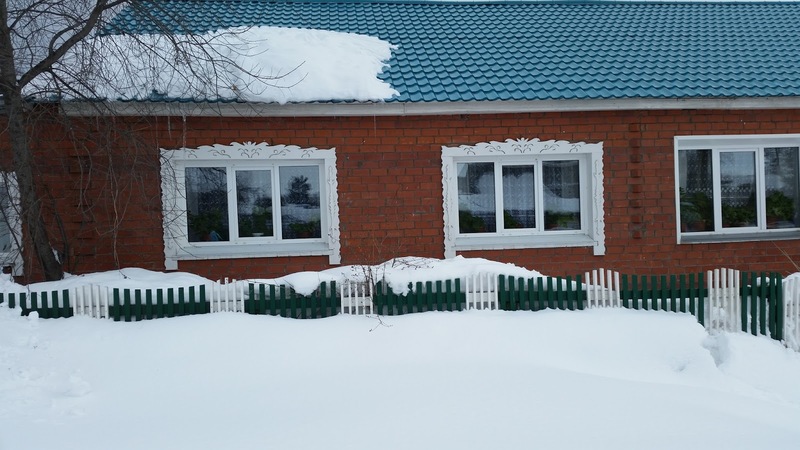 Upon arrival in Baikalsk check in at the cozy and comfortable hotel (rooms with private shower and toilet). Meet with your trainer for a briefing and introduction. Present reference from your physician stating you are in good physical health, and running in cold temperatures for over 3 hours non-stop will not do harm to your health (the physician reference must also have your normal blood pressure indicated). Then have a stretching exrecizes before dinner of local eco-specialties at the lodge followed by the lecture and video presentation on Lake Baikal unique natural features. 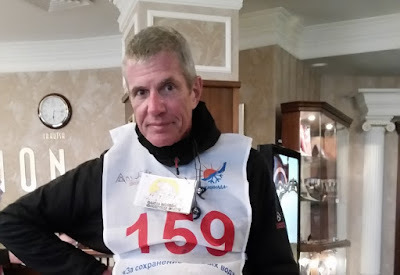 After breakfast – listen to the lecture of your experienced long distance runner on major running techniques in cold and extreme weather conditions. 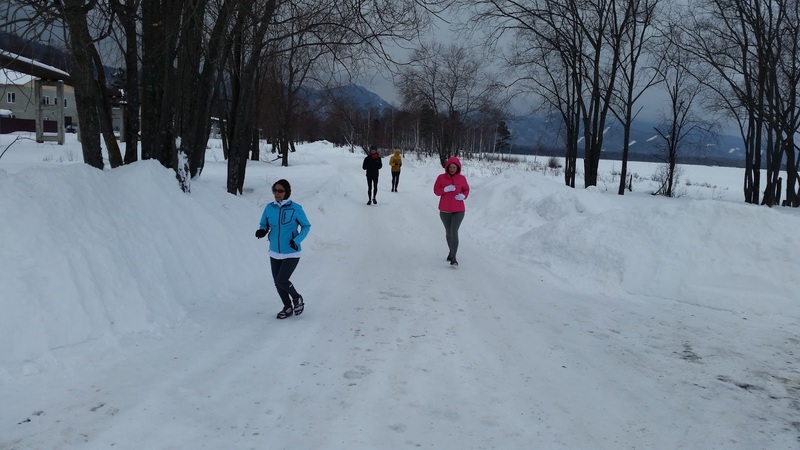 Then join the first test running session amidst the taiga-woods trails led by your trainer (7 km – no cutoff time). After blood pressure measuring have lunch. After lunch - transfer to a very popular Sable Mountain Alpine Ski center to undergo through another session of Acclimatization course on the slopes of beautiful Sable’s Mountain of the Khamar Daban Mountain range (your tour includes downhill ski or Snowboard package – please, advise us in advance of your shoe and ski poles sizes). After the downhill acclimatization session and plenty of downhill skiing return back to your lodge for dinner. After dinner –presentation of the video and running techniques on the ice of Lake Baikal . After breakfast, receive another lecture on the ice running techniques. Then join in the 2-nd running session – now run 8 km on the ice of Lake Baikal (with no cutoff time indicated). After blood pressure measuring have lunch. After lunch have one hour at your leisure. 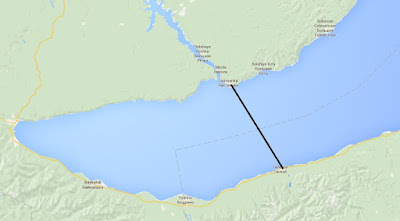 Then run another distance of 9 km on the Baikal ice (cutoff time will be indicated). In the evening after dinner – listen to your trainer speak about preliminary results and his recommendations. Overnight at the training lodge. After breakfast transfer to the Sable Mountain Alpine Ski center for 2-hour active relaxation downhill skiing or snowboarding the Mount Sable’s slopes. After final downhill acclimatization and leisure session, drive to the world’s unique steam bath - the BAN’KA - Ice Banya Steam Bath located on the very bank of the frozen lake Baikal where the river of Babkha flows into It. 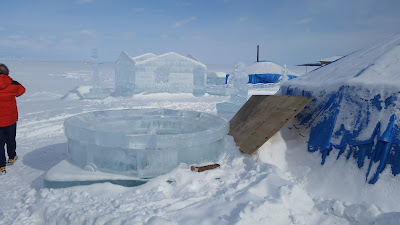 The Ice Banya is a part of the “Ice and Flame” project carried on by a group of young people of the city of Baikalsk (to construct the ice banya lodge they use over 150 metric tons of ice cubes from Baikal. 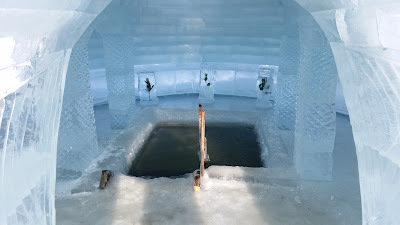 The ice banya has a steam/heat chamber, which can be heated in winter up to 120 ° Centigrade, relax and passage section and a pool- hole in the ice of Lake Baikal). Here you will have a steam-bath procedure with warming up inside the banya and cooling down in the Baikal ice pool, have herbal tea, and certainly, blood pressure measurement afterwards. 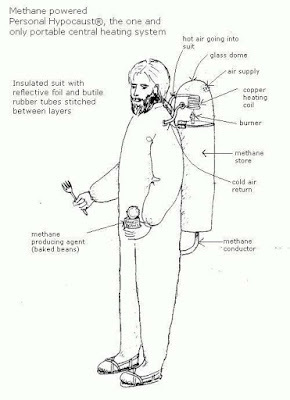 Upon return back to your lodge have lunch. After lunch – meet for the pre-start registration in the Baikal Ice Marathon, XI-th edition, start numbers distribution and final briefing at which you will know what distance you can wualify to run in the XII-th edition of Baikal Ice Marathon "For preservation of clean water". We are sure that once you are moderately fit and had at least 5-7 km running experience before coming to Lake Baikal, you will be able to run in BIM the next day. You have had by now enough expertise and energetic load that will enable you even to compete with experienced half marathoners, at least, whom you meet today also at the brefing. After dinner - meet again your trainer to receive his last instgruction for the next day great run on the Great Baikal! Also, your other bylingual guide will by this time record for you special tunes/music that will accompany you the next day and encourage for a challenge! 07:00 – move your entire luggage to the hotel lobby for its further transfer to Listvyanka (western shore). 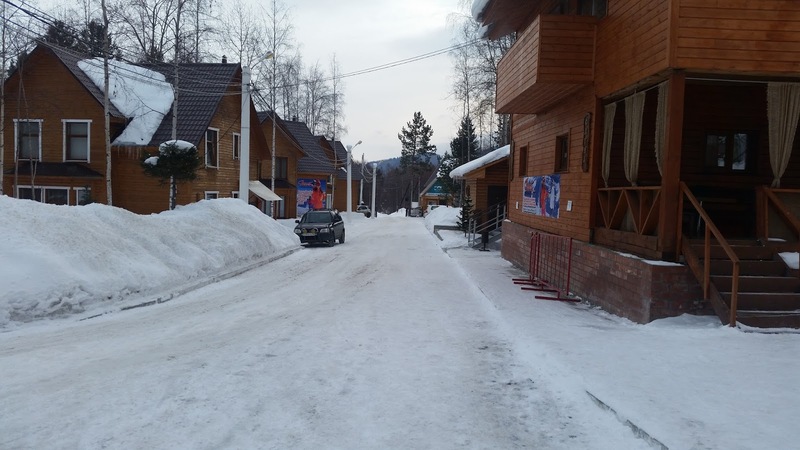 After breakfast transfer to the start line of the XVI-th Baikal Ice Marathon “For preservation of clean water” 10:30 a.m. – start of the Baikal Ice Marathon, XVI-th edition. After the cut-off time is over, the XVI edition of BIM is closed. 18:30 – Results Announcements and Award Ceremony followed by the Gala Party. Followed by overnight at the Hotel. 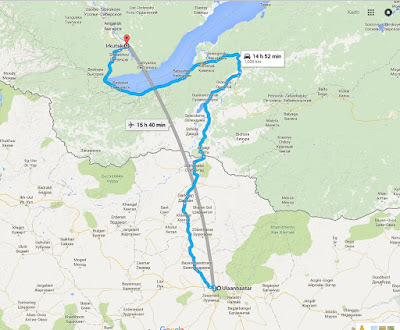 Transfers from your hotel in Listvyanka to Irkutsk airport for your return flight home. The cost of the above 7-days package on all iclusive and twin room sharing with another runner is euro 1485 per runner or runner's accompanying person ( accompanying person/non-runner sharing room with the runner - euro 950 p/p). Single room supplement - euro 375 p/p. My trip to Siberia began spasmodically. 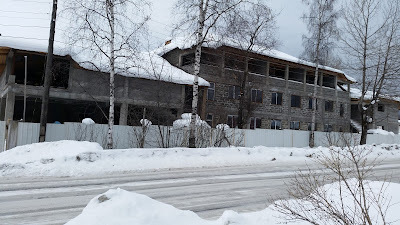 I made an error when I applied for a Russian visa in January, noting my date of arrival as March 2, the day I was scheduled to land in Irkutsk. I failed to consider my stopover in Moscow, which would happen a day earlier on March 1. When I showed up at LAX on Monday, Aeroflot told me that, due to the discrepancy, I couldn’t fly that day. I had to rebook. Tuesday, I was allowed to head out. 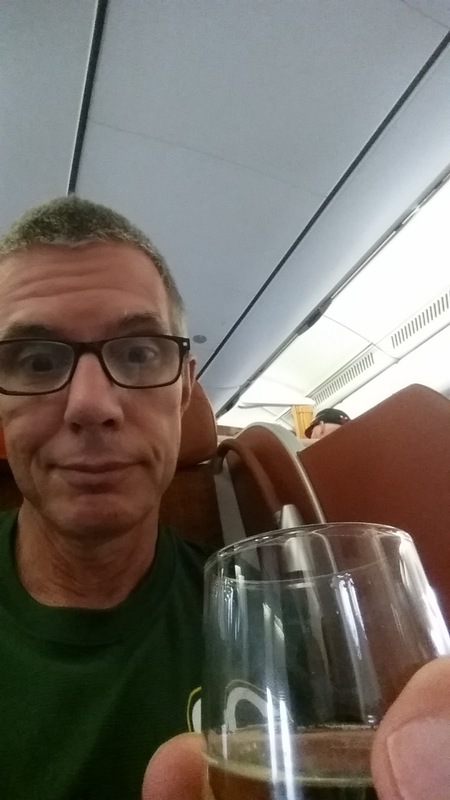 I took a 12 ½ hour flight to Moscow followed, after a two hour layover, by a five and a half hour flight to Irkutsk. I landed there at 4 a.m. Wednesday local time. 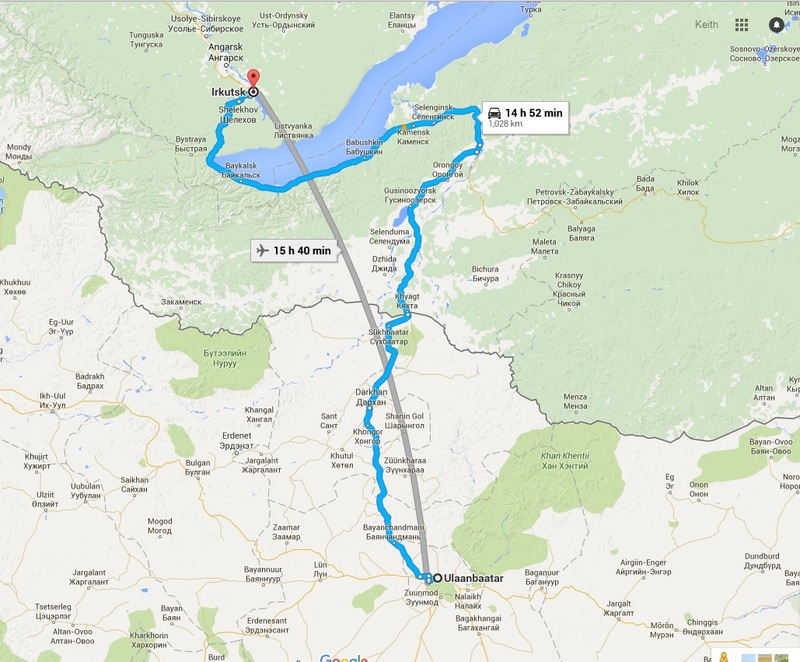 I was met in the terminal by a young Russian who drove me the 145 km to my hotel in Baiklask. Door to door I was traveling for 27 hours. Big thanks to Anna and Michael at 56th Parallel, the Australian booking agency I used for this trip, who arranged for my early morning airport transfer when they learned I’d be a day late. They’re saints. In Baikalsk, I was immediately swept up in the Baikal Marathon training program. At breakfast, I met the six other people who signed up for this package. We immediately became boon companions, sort of like the cast of Gilligan’s Island. 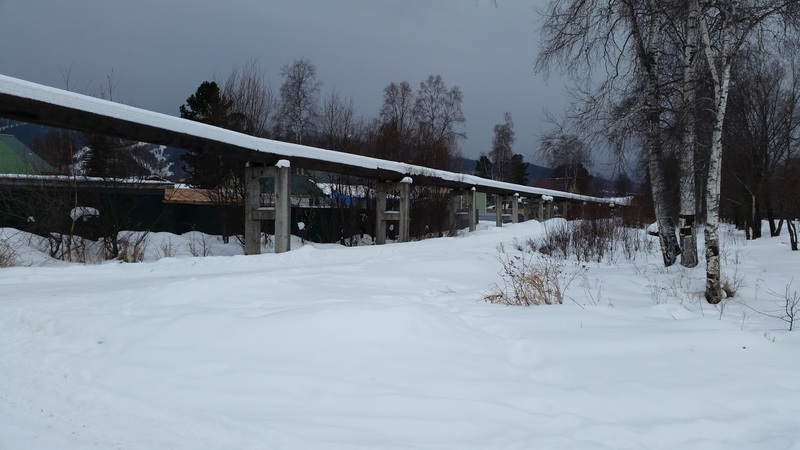 The training program includes a series of training runs on Lake Baikal, skiing at a local resort (I’m passing on that), and a trip to a steam bath. The latter includes a dip in the lake (Yow!) 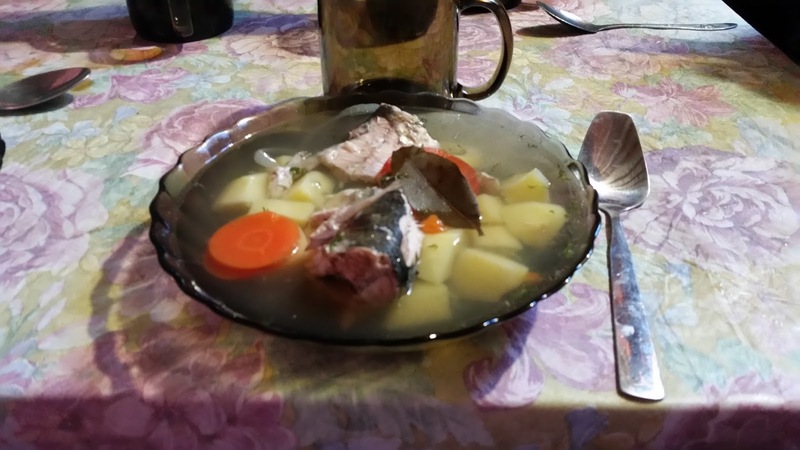 and a steaming bowl of Siberian fish soup (Yum!). The training program is run by Arkadiy Kalikman, a sweet-tempered Russian, who was the first person to run across Lake Baikal, has participated in all 11 editions of BIM and won it three times. He once piloted a kayak from Chicago to New York City. The photos here are from our first training run. We jogged through Baikalsk and made a big, sweeping arc across the lake. Fantastic! After that, having been awake of 44 hours, I got some sleep. 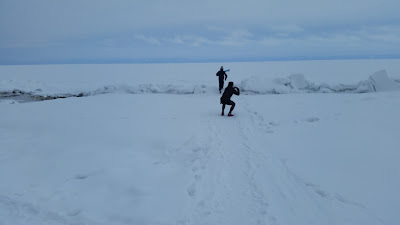 This morning after listening to a lecture on the aerobics of running from our guide Arkadiy, my Ice Marathon mates and I attempted to put theory into practice by making another assault on Lake Baikal. 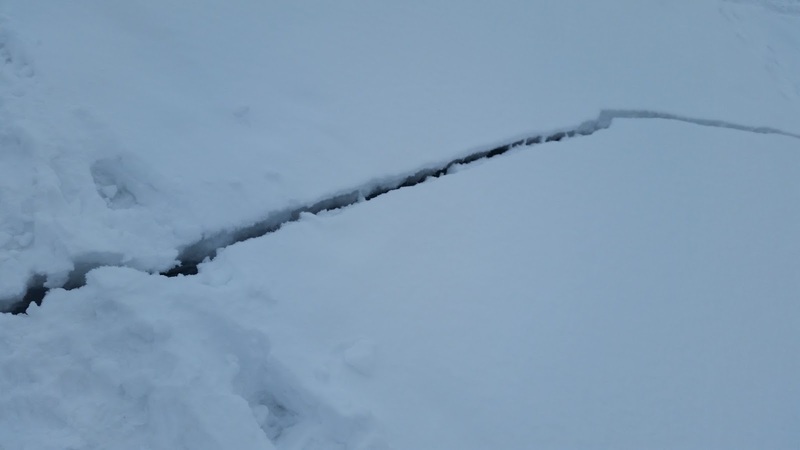 Yesterday afternoon, while I slept, a snow storm passed through leaving the ice covered in a blanket of fresh powder a foot deep. That turned our run into an awkward stumble. We soon gave up and reverted to tottering along on roads much to the annoyance of the local canines. After reviving ourselves at lunch over bowls of uhka (fish soup), we headed for a steam bath located a little further east along the lakefront. This establishment featured a wooden sauna surrounded by expertly crafted ice sculptures. 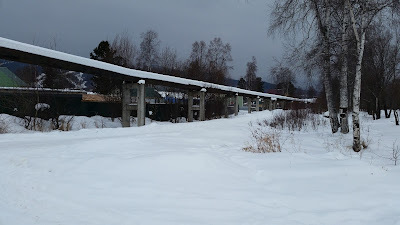 The sauna, which we were told the proprietor rebuilds each winter, was large enough to accommodate a dozen people and heated to a sweltering 95C. The idea was to sit inside the hot room until you couldn’t take it any longer (ten minutes or so), then scamper down a short pier to a hut made of ice that enclosed a small pool filled with frigid lake water. Dive in, then return to the heat. The effect of the cold water was quite remarkable, The heart rate soared. Pores snapped shut. Certain anatomical parts shrank to the size of peas. Once we’d gone through that routine three or four times, we retired to a yurt for hot tea and more uhka. If you’re curious, you can make uhka at home. Simply heat an aquarium to boiling, add potatoes and carrots. Simmer 30 minutes and serve. 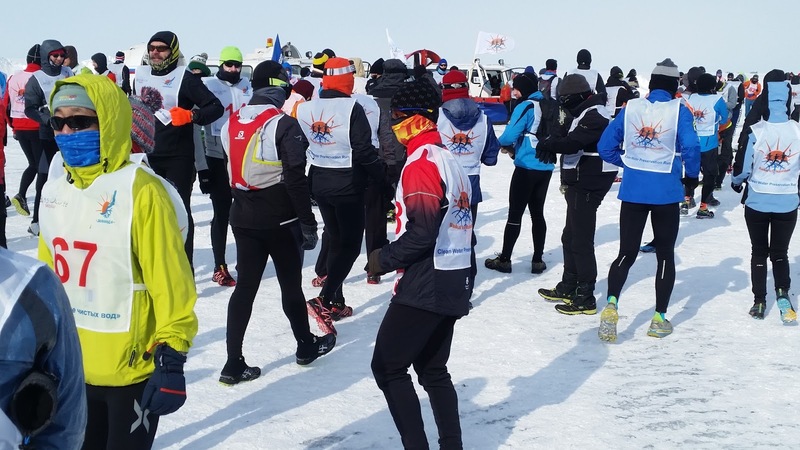 On Sunday, March 6, 150 or so Frenchman, Poles, Germans, English, Chinese, Japanese and Russian runners took part in the Baikal Ice Marathon. There may have been other Americans in the race, but I didn’t meet any. About a third of the participants competed in the half marathon, running 13.1 miles to the midpoint of frozen Lake Baikal and then hopping in hovercraft to complete the passage. The rest attempted the full crossing, 26.2 miles from Tankhoy on the lake’s eastern shore, to Listvyanka on the west. In its twelfth running, BIM lived up to its billing as one of the world’s most spectacular and toughest marathons. The view outside my hotel window on the morning of the race. 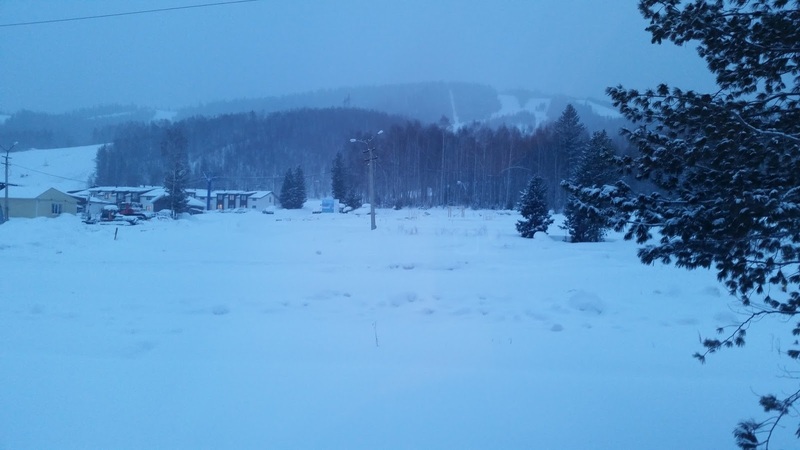 On the morning of the race, gentle snow was falling on the sleepy ski resort of Baikalsk, where we athletes stayed, a harbinger of what was to come. 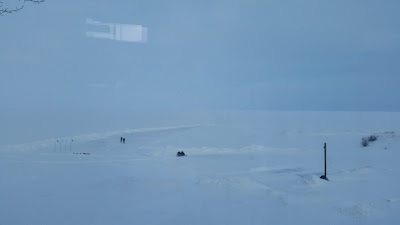 We ate a quick breakfast, loaded our luggage onto a truck to be carted around the lake, and boarded buses for the 75 km journey to the starting line in Tankhoy. The bus ride would have been familiar to most marathoners, excited runners chattering and gawking out the windows, except that we were gliding along on an unplowed highway through birch forest in the grip of heavy frost and two feet of snow. Upon arrival at the start line, we clambered into the Tankhoy Visitors Center, nestled against the lakeshore. Its rear window offered a splendid view of Baikal and our ribbon-like course cut through the snow. It twisted toward the horizon and disappeared into the mist. Like many others, I spent most of my time at Tankhoy in a cue waiting to use on of the two toilets available on site. Porta potties, evidently, have yet to reach Siberia. Our projected start time of 10:00 to 10:30 (“11:00 at the very latest”) eventually had us lining up about 11:15. The logistics of organizing eight or ten hovercraft, a dozen or so snowmobiles and sundry volunteers spread across 26 miles of ice are no doubt daunting. Eventually, though, and with very little fanfare, the command to start was sounded and we were off. The actual course wasn't nearly that straight. The plowed course was narrow. As a result, we began running single file with our left kept free as a passing lane. Over the first few miles, we sorted ourselves out, passing one another and being passed until we were more or less organized from fast to slow. The early part of the course offered a good running surface. The race crew had repeatedly plowed the track in days leading up to the race, leaving a dusting of snow over the ice. Perfect! I was zipping along, dreaming of the finish line and already congratulating myself on a job well done. Five or six kilometers into the run, the course began to change. 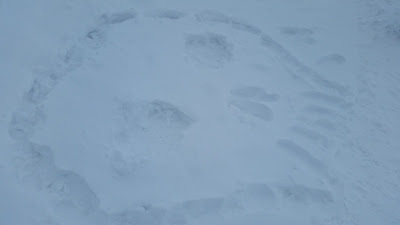 The wind was blowing snow back onto the track and we had to hop over small drifts. Not so bad. A few kilometers more and the track disappeared completely. We were quickly forced to abandon the “track” and bushwhack through ungroomed snow. From there on—the last 20 miles of the course—it was tough going through ankle deep snow. Footing was suspect and nearly all of the runners, me included, fell into the trap of weaving back and forth searching for terra firma, or rather snowa firma, that simply wasn’t there. That translated into stumbling, twisting ankles, stubbing toes and putting leg muscles through torture. It was unbelievably slow going. You could see forever, so, looking up, you’d perceive the snaky line of runners stretching ahead of you for miles. They were moving too, so you never got any closer to those objects on the horizon. In fact, because they were moving faster than you, you were falling farther behind. Occasionally, an unmoving, mirage-like object would appear on the horizon—one of the hovercraft that served as aid stations—and you would fixate on it like a castaway spotting a passing ship. Trouble was, it took ages, eons really, to reach that point. Once there, though, it was time to celebrate. That meant hoisting a glass of lukewarm tea with the Russians manning the station. Ваше здоровье! (To your health!) You could also help yourself to the odd assortment of goodies—chocolate bars, nuts, cheese—all frozen solid. Then it was back to the grind. To dwell on the difficulty of the task, however, is to miss its magnificence. Lake Baikal is colossal. Standing in its midst, you are witness to an unvariegated plain of white. A few miles into the race, you are wholly enveloped by a sparkling void. Now and again, you would come across a patch of the black ice for which the lake is famous. Staring down into this hazy prism you might glimpse fantastic objects fossilized in the frozen mass, or perceive liquid water far, far below. It was then that you could fully appreciate your position, gliding along on a thin veneer of glass above nearly a mile of abyss. BIM’s unique admixture of brutal conditions and otherworldly beauty is what gives the event its mesmerizing appeal. Somewhere past the half marathon point, the eastern shore became vaguely visible. With each slowly passing kilometer the outline of snowcapped mountains became clearer. 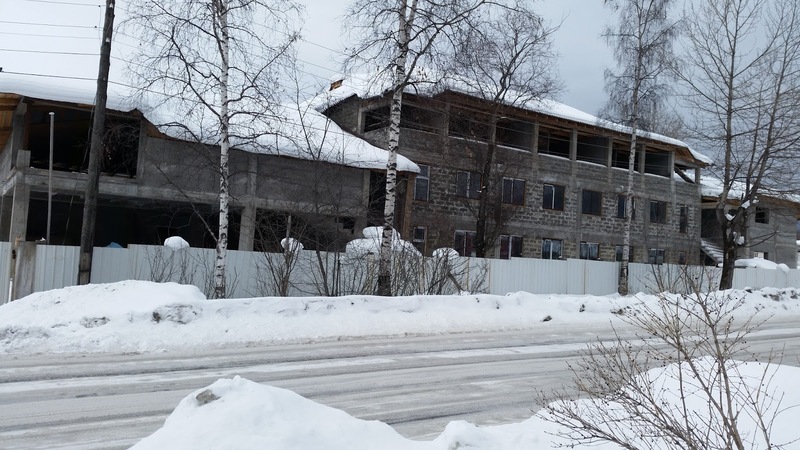 With 10K to go, it was possible to make out the outline of our pink 1960s vintage hotel in Listvyanka. The finish line! Seeing it was literally cold comfort as I knew, at my present rate of progress, it would be a good two hours before I got there. Predictably, the going only got slower from that point forward. Not only was there no relief from the snow, but the wind picked up and we encountered sections where splintered chunks of ice lay just below the surface. Footing became more precarious. In the hotel lobby after the race. The look says it all. I was beat, but my spirits were good. I began singly out loud to my iPod playlist. I’m not sure what other runners thought of my unaccompanied version of Mick Jagger, (“Star, f*** a star, fu*** a star, f*** a star.”) but no one seemed to mind. The language of love in universal. No road goes on forever. I eventually arrived at the finish line, greeted by an adoring crowd of two Russians. I beat it to the hotel, found my luggage and spent a good 30 minutes under a cascade of hot water until my body temperature returned to normal. A little while later, I joined all the participants for a celebratory feast of tasty Siberian cuisine washed down by beer and toast after toast of водка (vodka). Absolute Siberia, the organizers of this event, rendered astonishing service, managing our meal and hotel accommodations, arranging for a small armada of buses, trucks, snowmobiles and hovercraft, preparing the course (even if there best efforts were undone by the Great Baikal), hosting the banquet and promoting good cheer. The race is ostensibly a charitable event meant to raise money to preserve the lake, but I suspect the economic windfall is small vis a vis the titanic effort it entails. 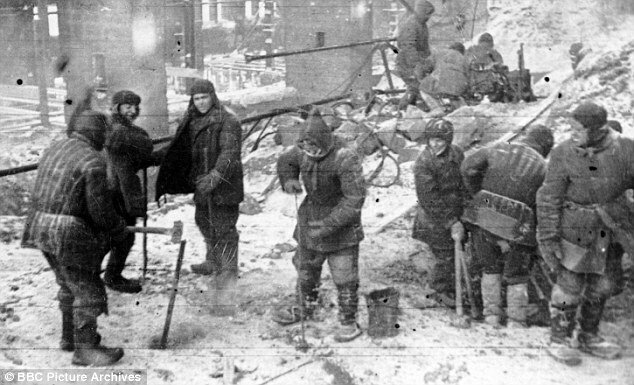 Rather, I assume these warm and hardy Siberian folk simply enjoy sharing their wonderful environment and culture with outsiders capable of appreciating their magic. The Absolute Siberia team scouting the ice before the race. Signing up for four days of pre-race training turned out to be a stroke of genius. 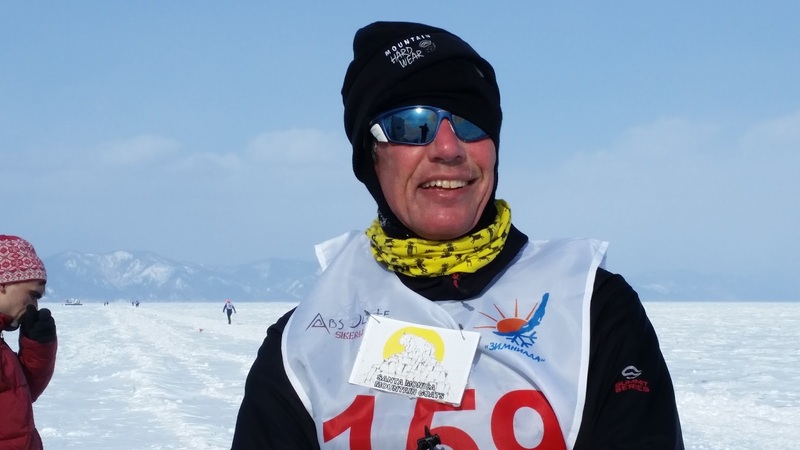 It not only afforded me the opportunity of scouting the lake in advance of the race, it brought me under the wing of Arkadiy Kalikman, our trainer, veteran of every running of the Baikal Ice Marathon and three-time winner. He gave us loads of advice about taking on this challenge and urged us to be philosophic in accepting whatever came our way. “Man proposes. 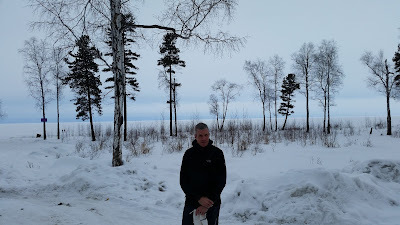 Baikal disposes.” I expected to experience the great lake, I had not thought I’d encounter a man who embodied its spirit in every fiber of his muscles and bones. What a joy! Now 68 years old, Arkadiy zipped past me at the 15 km marker and finished an hour ahead of me. 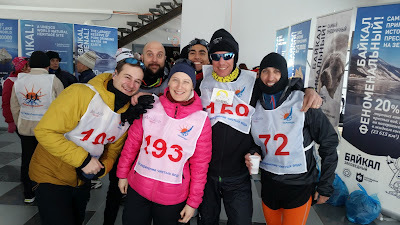 I also owe deep gratitude to the other six runners who took part in the BIM training program, Ed (UK), Sabrina (French from Moscow), Camel (Belgium), Alexander (German/Russian from Moscow), Alexander's French wife Oud (I’m sure I got that spelling wrong), and Pierre (France). We instantly became BFFs, did everything together and became mutual agents of encouragement and support. At the concluding banquet, when the finishers’ medals and tee-shirts were handed out, a clerical error caused me to be passed over. After going to bed, the others tracked down the race organizers, retrieved my goodies and presented them to me in the morning. What pals! The beginning, middle and end of my support system is, of course, my beautiful, wonderful wife, Linda Rosner. She not only immediately approved of my plan to travel more than halfway around the world to run on a frozen lake, she encouraged it and facilitated every detail and step. I am the luckiest man alive. The flame of life flickers briefly. Burn bright. Every now and again, you’ve got to s***-can the straight and narrow, say lah-de-dah to your worldly responsibilities and do something hare-brained, off kilter and fun. Two years ago, I traveled halfway around the world to take part in Transvulcania, a 50-mile race in the Canary Islands. It reduced me to tears, left my feet swollen to the size of footballs, and provided me with the incomparable experience of running up and over a volcano with a bunch of crazy Spaniards. Last year, I flew to Yellowknife in Northern Canada to trot along 30 miles of ungroomed trails on snowshoes. Beat to death, I quit two-thirds of the way through but I’ll never forget the experience of standing in the middle of a frozen lake without another living soul in sight. This year, I’m headed in a new direction. East. About as far east as one can go…to Siberia. My aim is to take part in the Baikal Ice Marathon, a running event that holds the distinction of not being held on land. 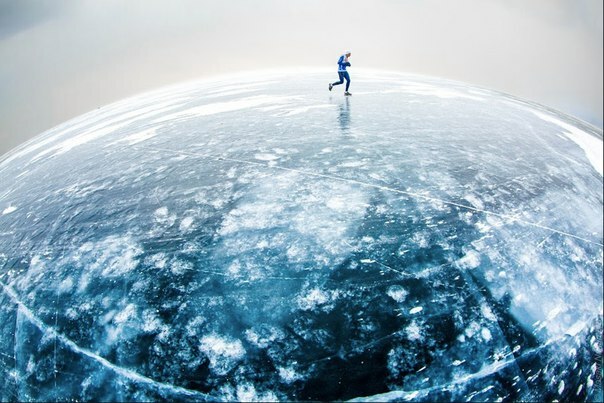 Rather, we runners will scamper 26.2 miles across a veneer of black ice covering Lake Baikal, the world’s deepest body of fresh water. 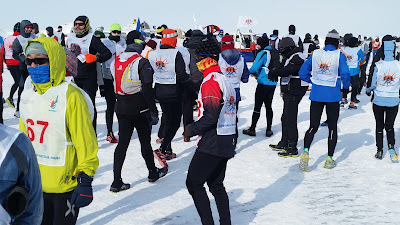 Now in its 12th year, the Baikal Ice Marathon attracts a hundred or so runners from around the world and regularly turns up on lists of the world’s toughest long distance runs. It sounds challenging, but I’m not convinced. I suspect such lists are compiled by interns at fitness magazines who run 10Ks and couldn’t find Irkutsk on a map. (It’s due north of Ulaanbaatar.) The course is arrow straight and so flat—varying no more than two feet along its full extent—they say you can just about see the finish line from the start. By that measure, it should be a piece of cake. “Siberia” conjures images of the gulag and bearded, thinly dressed political prisoners shivering in temperatures of minus 40. It won’t be anything like that for we runners. We’ll spend most of our time in a cozy hotel sipping the local vodka. During the race, we’ll be watched over by rescue teams on hovercraft and handed hot drinks by friendly commissars manning aid stations every five miles or so. 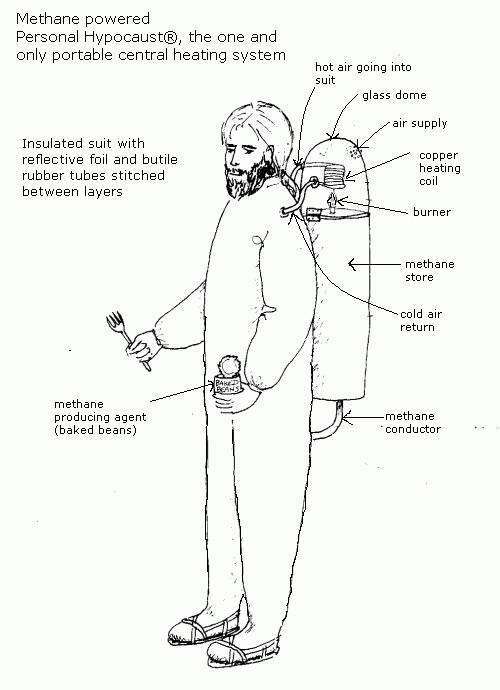 It may be cold…but I can tell you from experience that cold is a manageable commodity. Running gear these days is made from miracle fabrics that keep you toasty in all but the most extreme temperatures. Admittedly, your comfort could be impacted by wind, which not only sharpens the cold, but impedes progress. Surface conditions could also complicate the run. If it’s unseasonably warm, say 20F, snow softens. It’s like running in sand. 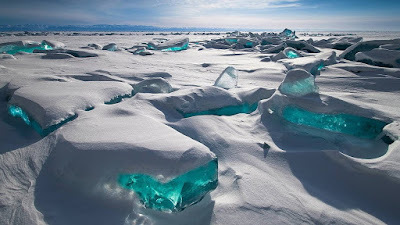 If it’s warmer still, I could discover just how deep Lake Baikal is. I bought a copy of Russian for Dummies and have been boning up on simple phrases that may come in handy when I run the Baikal Ice Marathon next month. Доброе утро, товарищ! Это великолепный день в России-матушке! Good morning, comrade! It is a glorious day in Mother Russia! Kaк далеко до следующей станции помощи? How far is it to the next aid station? Я не могу чувстсвовать свою мошонку. I can no longer feel my scrotum. By volume, Baikal is the world’s largest freshwater lake. It contains about 20% of Earth’s unfrozen surface fresh water, more than all the Great Lakes combined. It’s the world’s deepest lake, with a maximum depth of 5,387 feet, and the oldest, 25 million years. The lake is contained in a rift valley—a giant tear in the earth’s crust—which explains both its depth and its long, narrow shape. 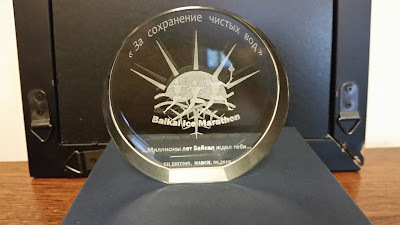 While Baikal has been around since the Oligocene Epoch, people have only been running marathons across it for 12 years. The possibility of charting a marathon course across the lake is the result of a quirk of geography. The course traverses the lake near its southern tip, its narrowest point. Running is also made possible by the weather. 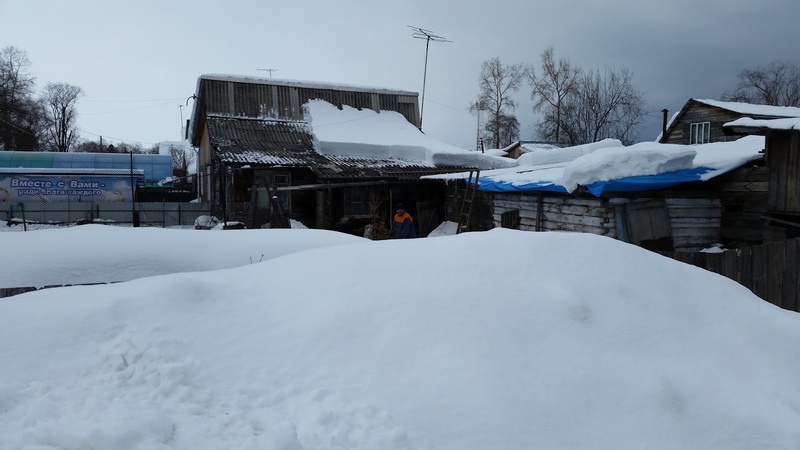 Siberia, as you may have heard, is cold in winter. Lake Baikal is dependably frozen over from mid-February through March. I think I’m ready for the khius and kolobovniks. In fact, as luck would have it, UPS just arrived and left a package containing a very important piece of gear. Looks like I may not need Russian for Dummies after all.